Join a student organization or employee affinity group, attend a lecture, or volunteer on a service project—Yale offers many ways to engage in efforts to create a more inclusive, equitable, and welcoming community. Grants are available to students, faculty, staff, and administrators for events, speakers, and programs addressing issues of diversity, equity, inclusion, and belonging and community at Yale. Learn more about the grants. Attend a campus event and join the conversation. RITM will support academic programs and events paired with activities addressing institutional diversity, equity, and inclusion. 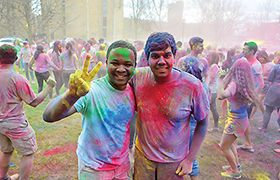 The Office of the Secretary and Vice President for Student Life supports student-organized programs promoting a sense of belonging and community.